We bought a watermelon at the grocery store last weekend. I made sure to grab a small one, but I still might have a little extra that will be tossed out. You never know around here. Well, I thought I'd get a head start on the extra by using it up in a different way. 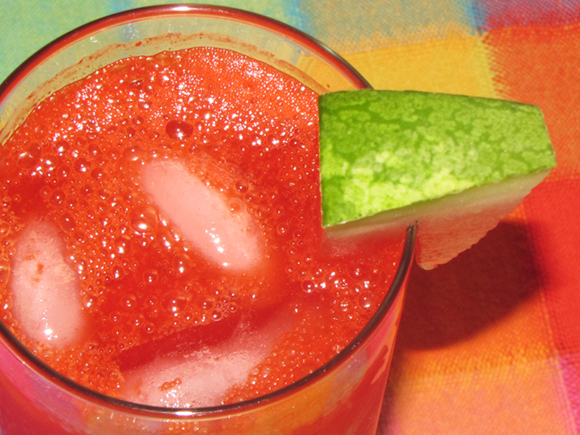 I whipped up this quick drink for my son and I and it's pretty darn tasty. And with the weather being as hot as it has been the past week, there's nothing better than a cool and refreshing drink on a hot summer day! 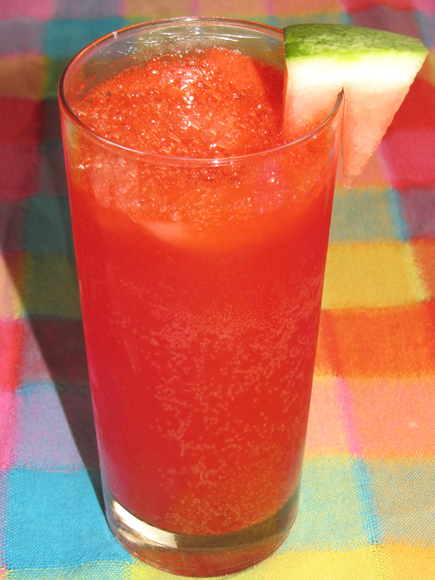 I used some pureed watermelon, a packet of strawberry Kool-Aid for some extra flavor and Ginger Ale for the fizz. I also considered using club soda but I only had about a quarter cup and it had lost it's fizz. This drink is good on it's own, but you might like to put a little sweetener in it if your watermelon has a slight bitterness to it. Mine did because it was small and a little under ripe, but I don't mind considering I'll even eat some of the white part close to the rind. Yeah, I'm strange like that. I'd like to play up this drink with some different flavors at some point, too. You know, get all Food Network on it and maybe add some mint or another herb. I also think this would be pretty tasty with a little rum and splash of lime. Hmm...that with the mint sounds like it would make an awesome Mojito. Guess I'll just have to give that a try! 1. Puree water melon then put into strainer. Mash with the back of a spoon to remove the pulp and leave the clear liquid. You should end up with 2 cups of watermelon juice. 2. Mix watermelon juice, kool-Aid packet and Ginger Ale together in pitcher. 3. Add 1 1/2 cups ice cubes and mix well. 4. Add a couple tablespoons of sugar or artificial sweetener if desired. 5. Pour halfway over ice filled glass then top off with a little extra Ginger Ale or club soda.